The world is filled with false information about cancer. 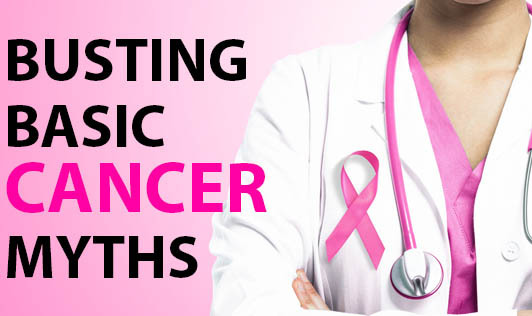 Here is a list of common cancer myths that will help you sort fact from fiction. Myth - Cancer causes hair loss. Fact - Cancer has no effect on hair growth or hair loss. Hair loss may occur as a side effect of cancer treatment, particularly chemotherapy, but this also does not happen in every case. Myth - Pain is the earliest symptom of cancer. Fact - Pain is usually a late symptom (except in cancers of bone & nerve tissue) and when it occurs, the tumor growth is often far advanced. Myth - Cooking foods in a microwave oven causes cancer. Fact - Cancer is caused by gene mutation which is triggered by one or more risk factors. Microwave cooking is a different form of convenient cooking. There is no scientific evidence to show that cooking foods in a microwave oven causes cancer. Myth - Cancer is incurable. Fact - Nearly 85% of the cancers can be treated; depending on the type of cancer & how early the patient goes to the right doctor. Cancer is curable if detected early. Cancers have chances of recurring, if the patients are not monitored carefully. Leukemia is the most common childhood cancer!